The kids are a big fan of the popsicle and we've experimented a lot with different flavors--these honeydew-kiwi ones are a lovely, all-natural bright green, for example. 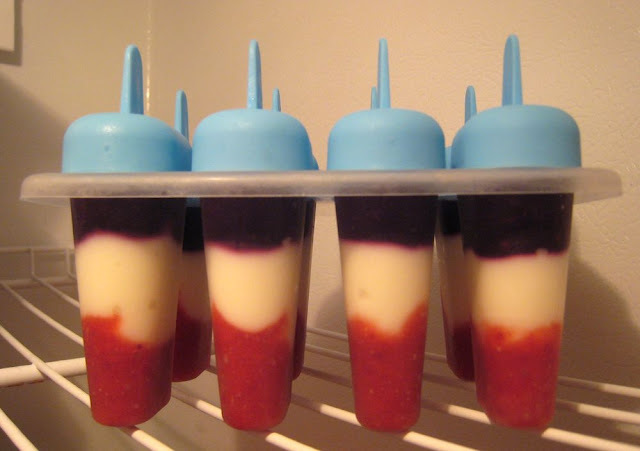 I've also espoused the idea of popsicles for breakfast, always an option when you make your own with real fruit. Since we're good on those options, today, it was time to make trickier popsicles, our own rocket pops! Ours are all-natural, made with strawberries, blueberries and vanilla yogurt, so again, these have breakfast possibilities! To make, you'll need berries, yogurt, popsicle molds, and a melon baller. Well, you really don't *need* the melon baller, but it is so much easier to layer the popsicles than with a regular spoon. My berries were frozen, so I brought each flavor to a boil (separate pots), then drained and pureed them with my mini-chopper. From there, I used a melon ball scoop of strawberry puree, wiping up any extra that stuck to the edges. That was followed by a melon ball scoop and a half of vanilla yogurt (again, wipe the inside edges if it drips), then a scoop of blueberries, up till the top. Add the popsicle sticks, chill and serve! Perfect layering, yummy and healthy! Cool! I want to try these!! Thanks!